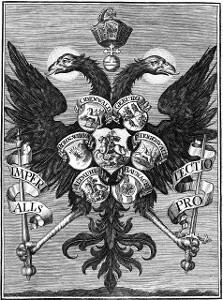 The Free Imperial knights (German: Reichsritter Latin: Eques imperii) were free nobles of the Holy Roman Empire, whose direct overlord was the Emperor. They were the remnants of the medieval free nobility (edelfrei) and the ministeriales. 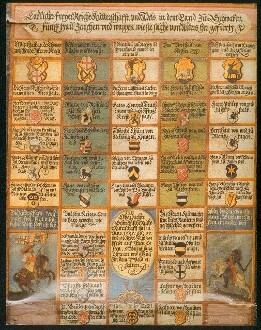 What distinguished them from other knights, who were vassals of a higher lord, was the fact that they had been granted Imperial immediacy, and as such were the equals in most respects to the other individuals or entities, such as the secular and ecclesiastical territorial rulers of the Empire (margraves, dukes, princes, counts, archbishops, bishops, abbots, etc.) and the Free Imperial cities, that also enjoyed Imperial immediacy. However, unlike all of those, the Imperial knights did not possess the status of Estates (Stände) of the Empire, and therefore were not represented, individually or collectively, in the Imperial Diet. To protect their rights and avoid vassalage to more powerful nobles, they organized themselves into three unions (Partheien) in the late 15th century and into a single body in 1577, and fought to win recognition. This status, beholden only to the Emperor himself rather than through a more powerful noble, meant the Imperial Knights were "immediate subjects" (their fealty was unmediated by another lord). As such, the Imperial Knights exercised a limited form of sovereignty within their territories. Their immediate status was recognized at the Peace of Westphalia. They never gained access to the Imperial Diet, the parliament of lords, and were not considered Hochadel, the high nobility, belonging to the Lower Nobility. The Free Imperial Knights arose in the 14th century, the fusion of the remnants of the old free lords (Edelfrei) and the stronger elements of the unfree ministeriales that had won noble status. Around 1300, the manoral economy suffered contraction due to the fluctuation in the price of agricultural foodstuffs. Ministeriales who were in a stronger economic position were better able to survive the weakening of their basis as landowners. The vast majority languished in poverty, resorting to selling lands to the Church, or to brigandage. The minority of ministeriales rich enough to weather the crises soon came to be identified with the remnants of the free nobility, and were thus seen as constituting one noble order. By 1422, some of these nobles had achieved jurisdictional autonomy under the Emperor (‘immediacy’), and the corporation of free imperial knights was born. The other ministeriales that did not manage to receive the status of immediate vassals of the Emperor were gradually transformed into a titled nobility of free status: the Freiherren (Barons). By 1577, the Imperial Knights achieved the status of a noble corporate body within the empire: the corpus equestre. In the Peace of Westphalia, the privileges of the Imperial Knights were confirmed. The knights paid their own tax (voluntary) to the Emperor, possessed limited sovereignty (rights of legislation, taxation, civil jurisdiction, police, coin, tariff, hunt; certain forms of justice), and the ius reformandi (the right to establish an official Christian denomination in their territories). The knightly families had the right of house legislation, subject to the Emperor’s approval, and so could control such things as the marriage of members and set the terms of the inheritance of family property. Imperial knights did not, however, have access to the Imperial Diet. All matters relating to the Imperial Knights' legal status as immediate vassals of the Emperor (house laws, debt, etc.) were managed by the Imperial Aulic Council. 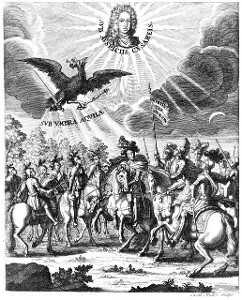 Lacking access to the Imperial Diet, in 1650 the immediate knights organized themselves into three 'Circles' (Ritterkreise): the Franconian, Swabian, and Rhenish Circles. The Circles were divided into cantons, each of which exercised a high degree of autonomy, possessing a director (Ritterhauptmann), and a directorate (Ritterräte und Ausschüsse) of noble councilors assisted by non-noble clerical and legal staffs. Whether or not an individual, an institution, or an area was directly subject to the Emperor's authority defined the status of ‘immediate’ and ‘mediate’ subject of the Empire (reichsunmittelbar, reichsmittelbar). The distinction was not restricted to noble subjects of the Emperor; for example, a number of high officials in the imperial courts and the chancery were immediate, whether noble or not. Arising from the feudal connection between tenure of land and jurisdiction, the status of immediate subject was further distinct from that of a state of the Empire. There were many immediate territories that were not states of the Empire, and there could be states that were not immediate. 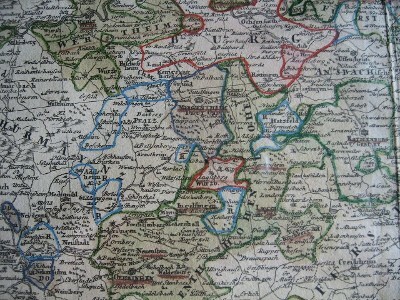 Examples of tiny immediate territories include villages (Gochsheim and Sennfeld near Schweinfurt), and some farms in Upper Swabia. The status of immediate subject of the Emperor could be held by an institution: the family of Thurn und Taxis held the imperial post as an immediate fief from the Emperor. Mediate entities were subjects arranged under an intermediate jurisdiction between the entity itself and the Emperor. The Imperial Knights were called very often to war by the Kaiser and therefore won significant influence in the Military and the Administration of the Empire and also over the more powerful nobles. 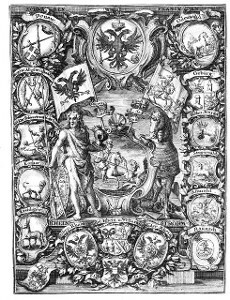 Every Canton had its own Ritterhauptmann or Captain and kept detailed records of noble families and properties. The Imperial Knights were exempt from imperial taxes and were not required to quarter troops. Over time the title of Imperial Knight became a title of nobility rather than occupation. 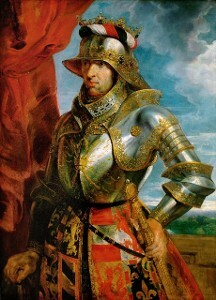 Many Imperial Knights even as early as the 16th century are more famous for their scholarly, artistic, or diplomatic work than their military achievements. With the founding of the Confederation of the Rhine in 1806 and the end of the Holy Roman Empire, the Imperial Knights' possessions, which were generally enclaves, formerly completely independent under the Kaiser, became part of the territories of the High Nobles, by whose territory they were surrounded. They, for the most part, took the title Freiherr and submitted themselves to their new lords. Exact numbers of Free Imperial Knights are difficult to assess. It is often stated that there were 350 knightly families in all three Circles, owning around 1,500 estates (c. 200 German square miles, or about 4,400 English square miles), with a total population of 400,000–450,000 inhabitants. These figures, however, are drawn from claims for compensation made after the upheavals of the French Revolution, and are not an accurate description of the total membership in the order. From early on, the membership of the corporation of Imperial Knights controlled access to admission to its Circles and Cantons. There were two kinds of membership possible within the order: personal and landed. Landed members were families enrolled in a Circle and Canton who owned an immediate fief, and thus were subordinate to the Emperor directly. The personal members (Personalisten) were non-landed members – regularly admitted – who had not yet acquired estates under knightly jurisdiction. As a result, the Personalisten were not included in claims made for compensation. Consequently, the numbers of landed families were probably closer to 400, with the Personalisten adding another 100, bringing the total number of knightly families to around 500 at the time of the corporation’s dissolution. Peter Apianus, who was made an Imperial Knight, was known for his contributions to mathematics, astronomy, and cartography Franz von Sickingen The Protestant Ulrich von Hutten Götz von Berlichingen Gottfried Heinrich Graf zu Pappenheim Florian Geyer Prince-Bishop of Würzburg, Julius Echter von Mespelbrunn, and leader of the Counter Reformation, Painting from 1586 Detail of tomb of Prince-Bishop of Würzburg Rudolf von Scherenberg by Tilman Riemenschneider in Würzburg Cathedral (1496–1499). Detail of tomb of Prince-Bishop of Würzburg Lorenz von Bibra by Tilman Riemenschneider in Würzburg Cathedral.